First off, we have a big circle of diameter d. Inside this circle, we tightly fit two smaller circles, each one of them having a diameter that's half the diameter of our initial big circle. This means that the diameter for each of these two smaller circles is equal to the big circle's radius r (or .5*d). Inside each of these circles of diameter r we have an even smaller concentric circle. If we are to draw a diameter for the big circle that passes through all the central points of all these circles - the line segment AB in the illustration above, the intersections between it and the inner circles split it into 6 equal smaller segments. This means that the diameter of one of the smallest circles is r/3 (or d/6) and its radius is r/6. Knowing all of this, let's get started with the first method! So let's start writing the code that can achieve this! All that's left to do before we get the static symbol is to give these two pseudo-elements borders. The black one should get a white border, while the white one should get a black border. These borders should be a third of the pseudo-element's diameter, which is a third of half the diameter of the big circle - that gives us $d/6. We now have the basic shape, so let's move on to the animation! This animation involves going from the state where the first pseudo-element has shrunk to let's say half its original size (which would mean a scaling factor $f of .5) while the second pseudo-element has expanded to take up all available space left - meaning to the diameter of the big circle (which is twice its original size) minus the diameter of the first circle (which is $f of its original size) to the state where the second pseudo-element has shrunk to $f of its original size and the first pseudo-element has expanded to 2 - $f of its original size. The first pseudo-element circle scales relative to its leftmost point (so we need to set a transform-origin of 0 50%), while the second one scales relative to its rightmost point (100% 50%). However, there's still one more thing we can do to make the compiled CSS more efficient: eliminate redundancy with CSS variables! This eliminates the need for witing all these rules twice: all we need to do now is flip the switch! Sadly, this only works in WebKit browsers for now because Firefox and Edge don't support using calc() as an animation-delay value and Firefox doesn't support using it inside hsl() either. Update: Firefox 57+ supports calc() as an animation-delay value and Firefox 59+ also supports using it inside hsl(). In order to draw an arc on a 2D canvas, we need to know a few things. First off, it's the coordinates of the central point of the circle this arc belongs to. Then we need to know the radius of this circle and the angles (relative to the x axis of the local coordinate system of the circle) at which the start and end points of the arc are located. Finally, we need to know if we go from the start point to the end point clockwise or not (if we don't specify this, the default is clockwise). The first arc is on the big circle whose diameter is equal to the canvas dimensions and, since we've placed the 0,0 point of the canvas right in the middle of this circle, this means we know both the first set of coordinates (it's 0,0) and the circle radius (it's r). The start point of this arc is the leftmost point of this circle - this point is at -180° (or -π). The end point is the rightmost point of the circle, which is at 0° (also 0 in radians). If you need a refresher of angles on a circle, check out this helper demo. Next, we're going to add the black circle to this path. We're not going to create another path because the aim is to group all shapes with the same fill into the same path for better performance. Calling fill() is expensive, so we don't want to do it more often than we really need to. A circle is just an arc from 0° to 360° (or from 0 to 2*π). The central point of this circle coincides to that for the last arc we've drawn (-.5*r, 0) and its radius is a third of that of the previous two arcs. All that's left to do is create a white circle, symmetrical to the black one with respect to the y axis. This means need to switch to a white fill, start a new path and then add an arc to it using almost the same command we used to add the black circle shape - the only difference is that we reverse the sign of the x coordinate (this time, it's +, not -). After that, we close that path and fill it. [0, 2] isn't [0, 1], so what we still need to do here is divide the whole thing by 2 (or multiply it with .5, same thing). This squishes our graph to the desired interval. Good, but what's up with that angle? We don't have an angle going from 0° to 360°. If we're going to use requestAnimationFrame, we just have the number of the current frame, which starts at 0 and then keeps going up. Well, at the beginning, we set a total number of frames T for one animation cycle (the first arc going from the minimum radius value to the maximum radius value and then back again). This rotation keeps adding up with every frame and we now have the rotating and morphing animation we've been after. Not too exciting, so let's move on to drawing something on the SVG canvas. Just like in the canvas case, we'll be drawing a path made up of the same three arcs (the big one with a radius that's half the size of the SVG viewBox and the two smaller ones with a radius that's half of that of the big arc in the static case) and two small circles (with a radius that's a third of that of the smaller arc they share their central point with). Now let's move on to the small circles. We already know the coordinates of their central points and their radii from the canvas method. There's one more method of doing this, although it involves changing things like the path data from CSS, which is something only Blink browsers support at this point (and they're not even matching the latest spec). It's also a bit breakable because we need to have the same radius value both in the SVG viewBox attribute and as a Sass variable. However, while this may be very helpful in some cases, it is useless here, as we currently have no way of putting CSS variables into the path data string we build with Sass. So we're stuck with having to set the same value both in the viewBox attribute and in the Sass code. Getting around the order problem is the easy part - we use the same animation-delay as we did for the scaling radii animation. So there you have it - one loading animation, four different methods of recreating it from scratch for the web. Not everything we've explored in here is usable in practice today. For example, the support for the last method is really poor and the performance is awful. However, exploring the limits of what's becoming possible these days was a fun exercise and a great learning opportunity. It’s awesome. I didn’t expect so large tutorial (with a lot of nuances) of drawing Yin-Yang loader when I read the title of the article. I particularly like the line drawing illustrations that lay things out instead of just jumping it. Every time I thought you were done, you just kept going with yet another implementation. The Canvas implementation is my favorite; I can never get enough of old school procedural drawing. Now, I wonder, isn’t it possible to do the SVG + CSS approach entirely cross browser (no path manipulation) using solely transforms (scaling the outer and inner circles as a group)? Well, I guess it’s possible, but not using a single path for the main circle. It would simply resemble the plain HTML + CSS approach, except instead of rounded divs, it would be circles nested in groups. CSS transforms on SVG elements are not cross-browser (Edge doesn’t support them). SMIL is not cross-browser (plus it’s markup vomit). Transform attributes can be changed in a cross-browser manner, but this requires JS. I think this is very clever, but I have an issue with how the philosophical symbol is being used here (and to some, it’s a religious sentiment as well). 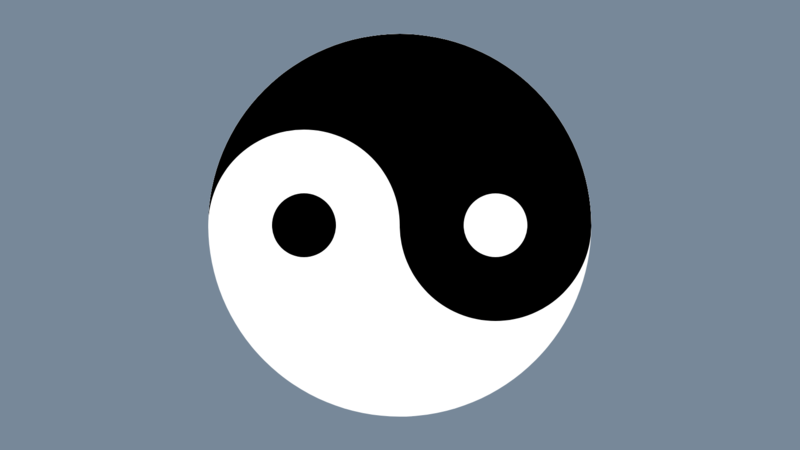 The yin and yang are to always be presented equally showing there is always equal positive and negative in everything. This balance is fundamental to the philosophy. The duality of the one. Showing them gaining and ebbing to each other is really antithetical to Taoism. Sort of like taking the arms of the Christian cross and stretching them to be equal length and back again. 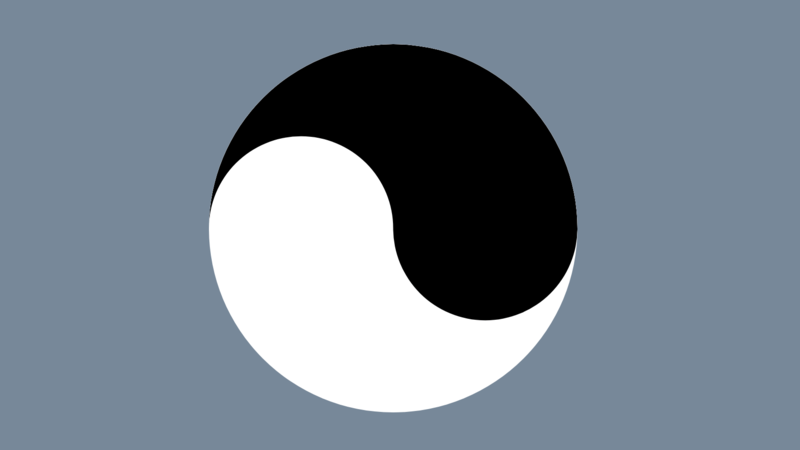 The specific shape of the yin and yang mean something more than a design element. Incredible job Ana. Will take me about 20+ reads to wrap my head around but I’m enjoying the challenge!